The “border run” rules and the “visa exemption” scheme, which allows nationals of more than 40 countries to temporarily visit Thailand without a visa, have recently been substantially clarified and standardized. On one hand, they’ve become considerably stricter. A few weeks ago only, we reported that foreigners who enter Thailand without a visa via a land border crossing can now do so only twice per calendar year. Entries through international airports are not affected by this new regulation, only so-called border runs. But there were also some good news. 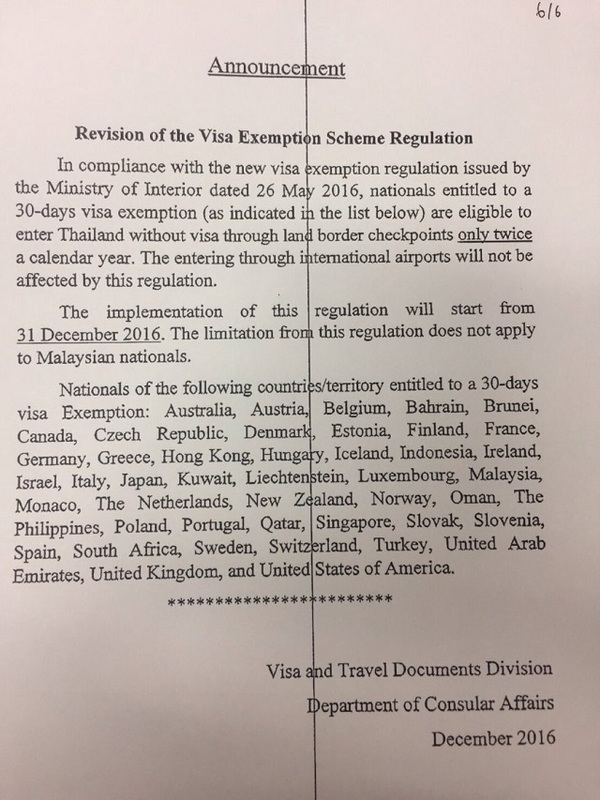 While eligible foreigners who enter Thailand under the “visa exemption” scheme would previously get 30 days exclusively at international airports but only 15 days at border crossings, this rule has now been relaxed and all will receive 30-day entry stamps also at land border checkpoints. Previously, only nationals of G7 countries (Canada, France, Germany, Italy, Japan, the United Kingdom, and the United States) and Russians were exempt from this rule and would get 30-day entry stamps at border crossings. To give an example, if you’re Swedish or Dutch, you would previously get 30 days at an international airport checkpoint but only 15 days at a land border crossing. 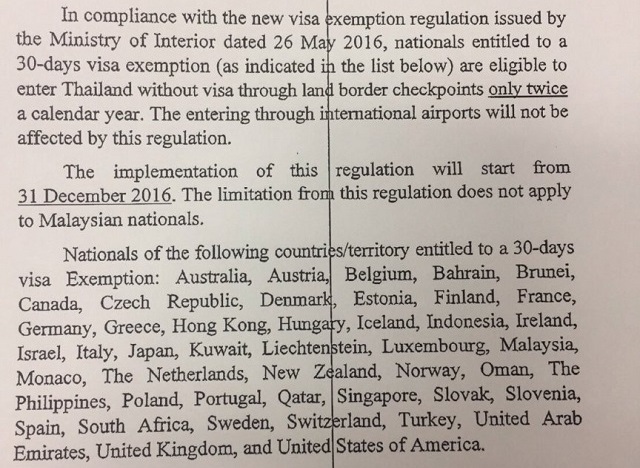 Now all eligible foreigners who may enter the kingdom without a visa (“visa exemption”) will get 30 days also at land border checkpoints. The following announcement was published by Thaivisa.com two days ago. The new rules went into effect on December 31, 2016. So what about a G7 national coming to Thailand by plane two times in a calendar year and each time also crossing a land border two times? Such things happen. Shouldn’t be a problem it seems. No difference anymore between G7/Russians and others. Just two entries via land borders. Arrivals by air not affected = as many as you like. Maybe a problem: if I am right, the counter was resetted at each new trip, which made a total of four land border crossings easy in one calendar year. This might be no more true. As I understand it: 2 visa-exempt entries by air + 2 visa-exempt entries via a land border per calendar year are okay. Remember that each 30-day stamp can also be extended by another 30 days at immigration, which might make a total of eight months visa-exempt stay per calendar year. Then again, only time will tell. I’m sitting in Savannakhet (Laos), having just been turned away from the Thai border, and the rules are as clear as mud. 1) The calendar year they’re referring to is the Thai calendar year, April to April. 2) The phrase “calendar year” is a mistranslation of “year”, i.e. last 12 months. 3) They hand out this piece of paper regardless of whether it’s relevant to your particular situation. This seems the most likely, as when I pointed out that I was not in violation of the rule, they said that the computer said “more than 90 days in last 6 months”. I have been here more than 90 days in the last 6 months, but less than 90 were on visa exemptions, so… I don’t know. I then pointed at the rule and asked whether if I flew into Bangkok tonight I would be admitted on a visa exemption, and the official said yes. Definitely? Definitely. But I have serious doubts about this, because the rule I was pointing at doesn’t seem to be the one I was rejected on. Given that my stamp out of Laos was canceled by the guard putting a signed post-it note in my passport (gotta love Laos), I don’t think I can chance it, and will stay another 5 days getting it from the embassy. Needless to say, the Thai border official showed a combination of malignancy and existential weariness attributable to the accidents of history, geography and gender that had precluded her membership of the SS. Sorry to hear about your bizarre situation. So this was your first attempt to enter Thailand without a visa (visa exemption) by land? Whatever, I also thought it was two visa-exempt entries per calendar year (and that’s exactly what the new rules state) so they should have let you enter Thailand anyway i.m.o. I’m not sure about the “maximum 90 days in six months” thing either. There have been rumours about it but, as far as I know, it was never actually confirmed on paper. I agree you should be allowed to enter Thailand on a visa-exempt entry by air as it clearly says on some Thai embassy websites that there’s no limit to the number of times you can enter Thailand without a visa through an airport checkpoint (though they might question you re: what you’re doing in the country, ask for proof of financial means to support yourself – I think 10k Baht per person on a visa-exempt entry – etc.) Alternatively it might be the safest option to apply for a tourist visa at the Thai consulate in Savannakhet on Monday. Unless you’ve already had “too many” tourist visa stickers in your passport you shouldn’t have any problems. On a sidenote, I’m currently in a difficult situation visa-wise myself and find it a shame how increasingly hard Thai authorities are making it for foreigners under 50 (and over 50 too now it seems) to stay in the country long-term. Anyway I wish you good luck & keep us updated on your situation please.